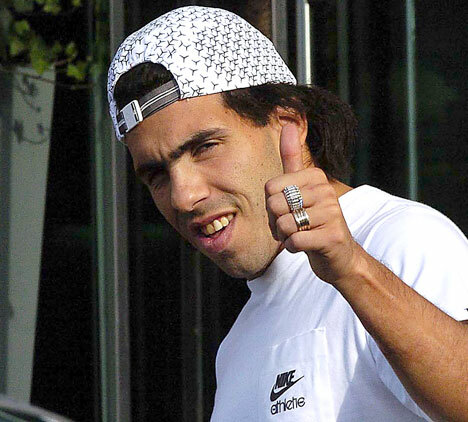 Carlos Alberto Tévez (born Carlos Alberto Martínez on 5 February 1984) is an Argentine professional footballer who plays as a forward for English club Manchester City and is currently the team's captain. 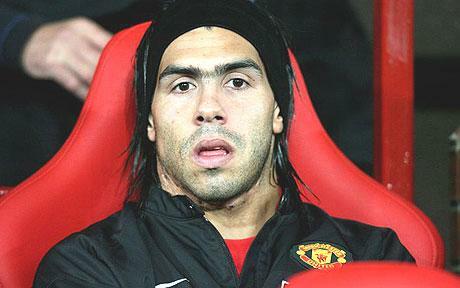 He has previously played for Boca Juniors, Corinthians, West Ham United and Manchester United. He transferred to Manchester City in the 2009–10 summer transfer window, becoming the first player to move between the two clubs since Terry Cooke in 1999. His energy and goal scoring rate has since made an indispensable player for the club in the eyes of fellow players and media alike, his importance was marked by promotion to captain at the beginning of the 2010–11 season by manager Roberto Mancini. His career has been dogged by a long-standing affair with Media Sports Investments, the company which owned the rights of Tévez, and several other players and coaches. This eventually resulted in West Ham United being fined over issues regarding third-party ownership. He has made over 50 appearances for the Argentina national team, scoring 12 goals. Manchester City boss Roberto Mancini revealed Inter Milan are interested in Carlos Tevez but is adamant the striker will stay put. The Argentinean appeared to have resolved his unhappiness at Eastlands after submitting a transfer request to the club. Mancini, who refused to strip Tevez off the captaincy despite his fall-out, admitted interests from his former club but remains confident over the striker's future at Eastlands. He said in an interview with Sky Sports Italia: "I believe Inter like him and Moratti has always been fascinated by Tevez, this is normal. "I don't think he will go. He will stay here. He has a four-year deal and so it will be difficult for him to leave." Mancini went on to pay tribute to the 26-year-old after his two-goal display in City's 3-1 defeat of Newcastle United on Boxing Day helped the club to third place in the league. "He scored two goals in an extraordinary game," he said. "I am happy for him, he always makes the differences and he always fights for everything. I am happy he scored two in a difficult game." "It's important for us to be up there. It's difficult to give us a vote. City has improved plenty in one year. But we still have to work harder to improve." Looking forward to the January transfer window, Mancini revealed his interest in Wolfsburg striker Edin Dzeko but remains coy over a move for him. "I think when there is a player like Dzeko many clubs want him," he said. "We have to wait and see what happens in January. Nothing is certain, but nothing is impossible in football." City are just two points behind league leaders Manchester United, who have two games in hand. di maría, adebayor... and, now, tevez?! anyways... WTF is that pair of polar bear boots that "actress" was wearing??? ridiculously awful! man... that girl's a highlander, isn't she?! imagine yourself kissing those disgusting lips. well, i guess she must think positive: "fame and money, fame and money...". it's her mantra!